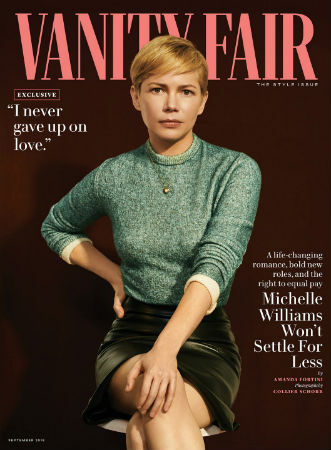 –Michelle Williams‘ new Vanity Fair cover story is very good. There is a bit of set up weirdness (the writer mocks the typical profile intro of writing about what the actress is wearing or eating — and then does it? ), but the interview itself is great. Williams reveals that she recently got married (“I am finally loved by someone who makes me feel free”), reflects on the lessons she learned from her pay-gap scandal, which she credits Jessica Chastain for helping bring to light, and talks about her new TV series produced by Lin-Manuel Miranda (“When they told me about it, I thought, O.K., now comes the part where I have to go in kicking and screaming and shouting about equality and transparency…Then, before I could even ask for it, they said, ‘They’ve offered you what Sam Rockwell is making.’ I cried”). –Jenna Dewan calls her split from Channing Tatum “a positive thing” and “the new normal” in her People profile. -I always forgot that Beyoncé has twins. And then she posts a photo of them and I remember all over again. Every. Single. Time. -Also, Amber Rose says Gwyneth Paltrow is the ‘Becky with the good hair’ referenced in Beyonce‘s song ‘Sorry’. WHAT. –Karlie Kloss posted an Insta story in which she shared screenshots of famous friends like Serena Williams (but not Taylor!) reacting to news of her engagement on FaceTime, and in doing so revealed Princess Beatrice’s private account. –Penn Badgley and Shay Mitchell‘s Lifetime series You has been given an early season 2 renewal, even though the first season hasn’t started airing yet. Considering how the book ends, I don’t get what this is going to be. -Wait, so the Buffy reboot is not a reboot after all? It’ll just be in the same universe? Why didn’t they just say that in the first place?!? All of these reboot announcements need some serious workshopping. -On the Tonight Show, Nanette comedian Hannah Gadsby described her awkward first encounter with Emma Thompson, which ended with them crying on each other’s shoulders and Hannah accidentally texting Emma a photo of Chuck Norris. -The cast of The Walking Dead did impressions of Negan in front of Jeffrey Dean Morgan. Danai Gurira was my fave. -Also, Norman Reedus said he and Andrew Lincoln had a pact to leave The Walking Dead together. Oopsie! -The critic embargo for The Spy That Dumped Me was just lifted and the reviews are…not good. Like, really. I’m still gonna watch the crap out of it, tho. -Speaking of movies I’m going to watch the crap outta, The Hating Game is being adapted for the big screen! This is hands-down my favourite fluffy book which I re-read whenever I’m stressed. Which means I re-read it A LOT. In my fantasy casting, I see Anna Kendrick or Zoey Deutch for Lucy, and Matthew Goode or Mike Colter for Josh. Make it go, Hollywood! –Carlton Cuse‘s adaptation of Locke & Key has finally found a home on Netflix. People *adore* this comic book. -Despite superstar careers, Jemaine Clement and Bret McKenzie are bringing Flight Of The Conchords back to HBO for a live special. –Natalie Portman plays a NASA space captain in Noah Hawley‘s film directorial debut. As someone on Twitter mentioned, she looks exactly like Mike from Stranger Things. -According to the writers guild, two thirds of female writers say they experience sexual harassment on the job. That’s insane. -The more I see of To All The Boys I’ve Loved Before, the more I can’t wait to watch this on Neflix!